How important is the RDX to Acura? Not only is it their best-selling vehicle but this 2019 redesign is being herald as the beginning of a new era for Honda’s luxury division. Remember the Super-Handling All Wheel Drive system that was skipped in favor of a lighter, simpler setup for the 2013 redesign? It’s back. How about the original’s turbocharged engine? That’s back too. This time it’s mated to a 10-speed automatic transmission working in concert with Acura’s acclaimed torque vectoring all-wheel drive system for sportier handling, available as an option. Also available is a new Adaptive Damper System with 4 distinct drive modes ranging from Comfort to Sport +. A racier A-Spec treatment will also be part of the RDX portfolio. There’s a new platform that’s not shared with Honda featuring a lighter and stiffened body – wider and longer with what Acura claims is class-leading cabin and cargo space. Newly designed sport seats highlight a cabin Acura has imbued with higher-grade materials including soft Napa leather and the RDX debuts an all-new touchpad, not touchscreen, interface featuring an Android-based operating system and an over 10” high mounted screen. Four ultra-thin, ceiling-mounted speakers compliment the ELS Studio 3D hi-fi audio system. Full details will be revealed at the upcoming NY Auto Show. 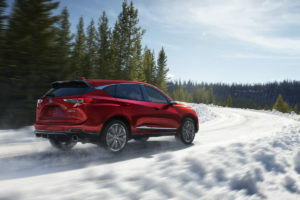 Look for the all-new 2019 RDX midyear.